“The constellations we recognize today are mostly from the ancient Greek culture. You are no doubt familiar with Orion the Hunter, Ursa Major, Cassiopeia, and all twelve zodiacal constellations. But did you know that the Lakota Indians saw Orion as a hand? Or that there are more interpratations of the big dipper than anyone cares to count? Read on to discover the different myths backing the patterns in the sky. The Lakota Indians on the other hand, saw a huge Hand in the heavens which was a symbol for peace between the gods and the humans. The Lakota Hand and Orion share many of the same stars but because of the differing legends in the Greek and Lakota cultures they connected the dots in entirely different ways. To the ancient Egyptians, Orion was hailed as the god of the sun, Hindus saw an arrowed stag in these stars, and the Chinese see the White Tiger. Sometimes though, hugely different peoples saw similar things. Ursa Major was seen as a bear in both ancient Greece and the Navajo Nation, and the stories surrounding it are surprisingly similar; both involve women transforming into bears and being killed by their unrecognizing families. http://www.lpi.usra.edu/education/skytellers/constellations/about.shtml: The constellations were created in part to help people remember stars used as markers for seasons. In our cities, we often cannot see all of the stars. If you were to visit the Mojave desert, or go to a dark sky site where there weren’t any cities nearby, you would really see stars! Our cities are light-polluted with all night billboards directing their beams to the sky, and parking lots with bright, unshielded lights…and all the other bright lights–some necessary, some not. Most of our stars are washed out, and we only see the brighter stars. Before we had cities spilling light into the night sky, amplified by layers of pollution, people could see skies packed with stars. It is difficult to pick out the most familiar constellations when there are soooo many stars. In ancient times, when the moonths were the annual calendar, people studied astronomy to help them know when to plant and when to harvest. They knew when the rivers were likely to overflow…the Egyptians noted that the cycles of the Dog Star, Sirius, coincided with the rise and fall of the Nile River. They could accurately predict the Nile floods. Some of the Native American cultures noted that when the Big Dipper…they could see Ursa Major, the Great Bear…dipped low in the western sky, the leaves of the trees would turn red. Fall was here. The story goes that three hunters were trailing the bear. The hunters were the three stars that we see as the handle of the Big Dipper. One of the hunters had shot the bear in the side, but the wound wasn’t serious enough to stop the bear. The middle hunter carried a pot on his shoulder to cook the bear meat in, but the hunters never got close enough to kill the bear. He went crashing through the forests of the night, always managing to keep the same distance ahead of the three hunters. At the end of summer, the bear and the hunters grew tired, and they dipped lower and lower toward the horizon. When the bear got very close to the horizon, close enough for blood to drip from the wound in his side onto the trees, the people noticed that the leaves turned red. It was time to harvest and finish preparation for winter. Many sea-faring cultures used bright stars…and constellations that help you remember the bright stars…to navigate their ships at night. It would be disastrous to be lost at sea, so they learned the brightest stars, and made sure that they could remember them by making up stories about them. Identifying a grouping was easier than picking out individual stars, so constellations were created. Different cultures had different constellations…they didn’t always see the same thing, because they might not have experience of the same animals or myths. Most cultures saw what we call the Big Dipper as Ursa Major. If you have a dark site, you can see the bear, with his triangular head, his legs with claws at the end of his paws…and either a loooong tail (for a bear), or the three hunters following the bear. The natives of Great Britain, however, saw it as the Great Wain (wagon), the Egyptians saw it as merely a portion of a huge bull, and the Chinese saw it as part of a celestial chariot. We see it as the Big Dipper, partly because that portion of the body and tail (or hunters) is the only part that can be seen through light-polluted skies. Orion has been identified by both classical (Greek and Roman) and Native American cultures as a hunter or warrior. At his feet, Canis Major stands point over a rabbit (Lepus), but his attention is not on the rabbit…he is more concerned with the charging bull (Taurus) with the long horns. Part of the important procedure of making a constellation is the invention of a story that goes with the image. 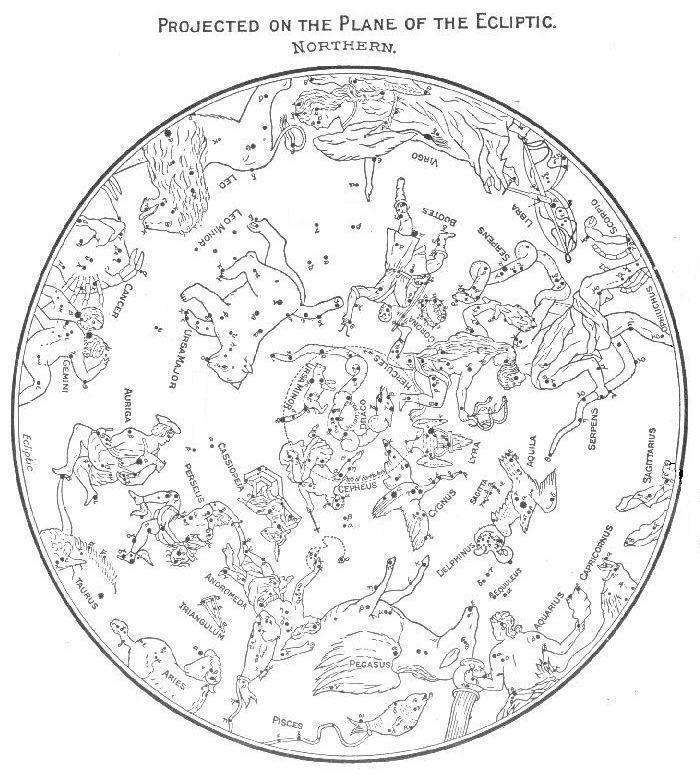 Many of the constellations are based on characters from myth or legend. Perseus, Casseiopeia, Andromeda, Pegasus and Cetus are all intertwined in a complex story. You may have seen the movie, “Clash of the Titans.” The movie covers several of the myths used to provide story material to help you learn the constellations.